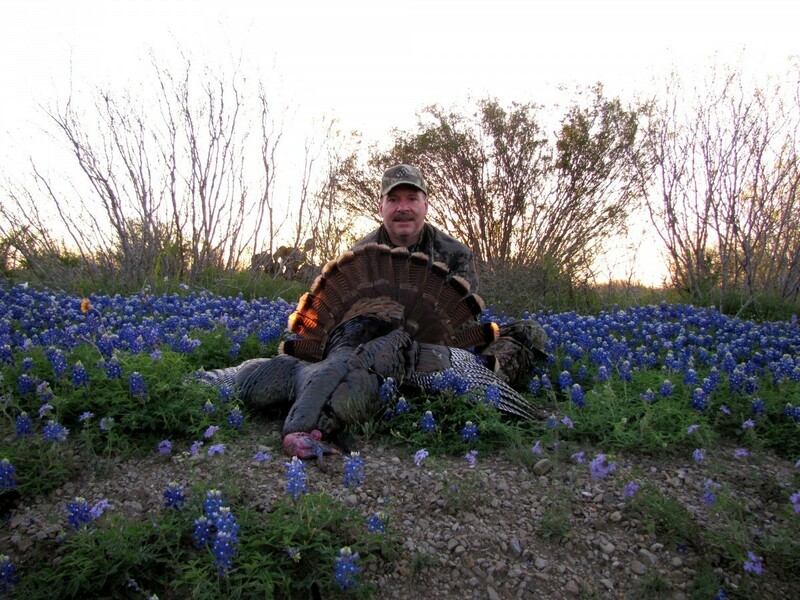 Book your Texas Turkey Hunt here! 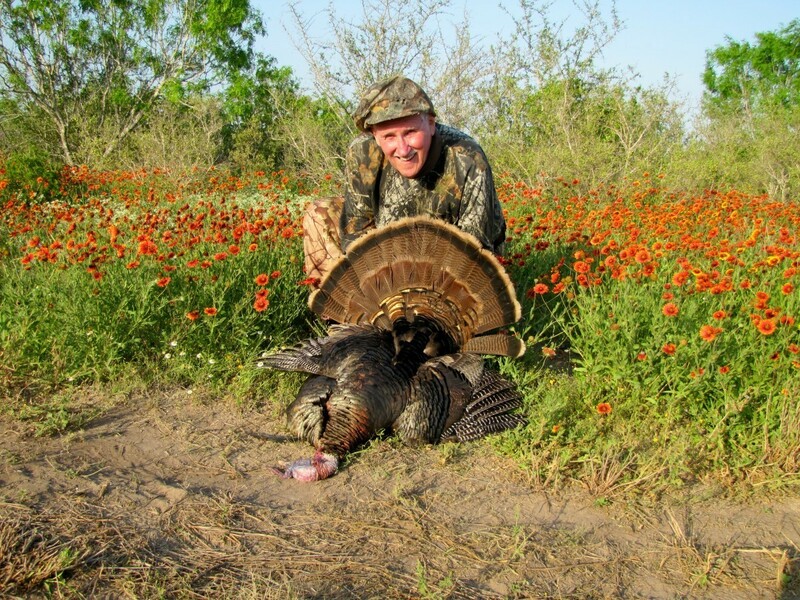 With an estimated turkey population of over 600,000 birds, Texas is a premier destination for turkey hunts. 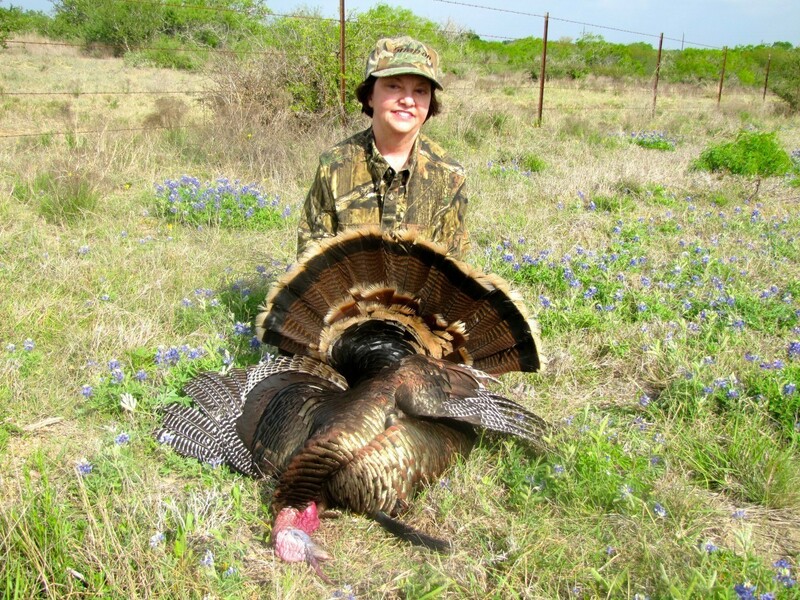 The majority of those birds are found in the Texas Hill Country and Edwards Plateau, but turkeys can also be found in parts of South Texas, North Texas and even a few out in West Texas. 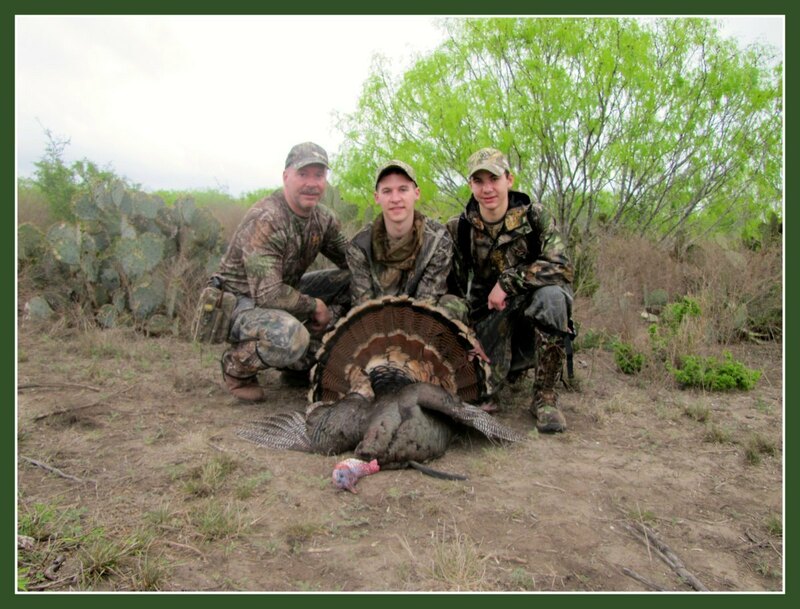 There are a few counties in East Texas that have the “Eastern” wild turkey, but with all of my ranches being in South Texas or the Hill Country all of my turkey hunts are for Rio Grande Turkey. The majority of my turkey hunts occur during the spring turkey season, which runs from mid-March through the end of April, when the toms are strutting and gobbling, but we occasionally hunt turkeys in the fall season, which runs concurrent with the general whitetail season. Most of my turkey hunters enjoy the thrill of calling for themselves, so all of my turkey hunts are semi-guided, but a guide can be arranged for your hunt for a small added daily fee. As is the case for all of my hunts, I’ll be on your turkey hunt to help ensure you, or your group, have the best experience possible and have the best chance of taking home the best trophy possible. 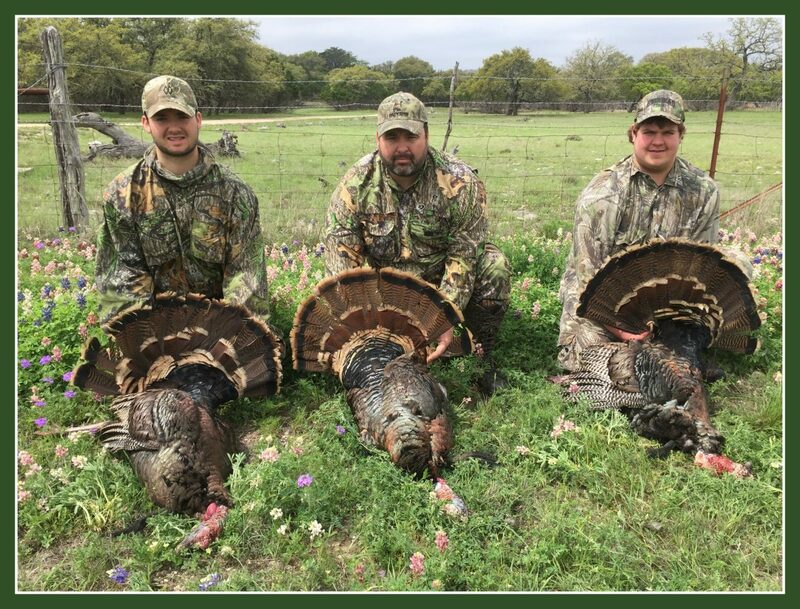 With several ranches in the Hill Country and South Texas I can easily accommodate turkey hunts for individuals, friends, families or corporate groups. Hunting pairs such as husband/wife, father/son or daughter, or a couple of buddies can also be easily accommodated. Depending on the number of hunters in your group I’ll either provide you with your own part of the pasture to hunt, approximately 400-800 acres/hunter, or if the group is large enough y’all will get the entire ranch and lodge to yourselves. Your turkey hunt will typically start within calling distance of a roost or feeding area, either in a ground blind or hidden in the brush, and from there you will be free to “run and gun” or sit and call depending on your preference. Most hunters will hunt until noon and then come in for a lunch, and maybe a short nap, before they head out for the afternoon hunt. 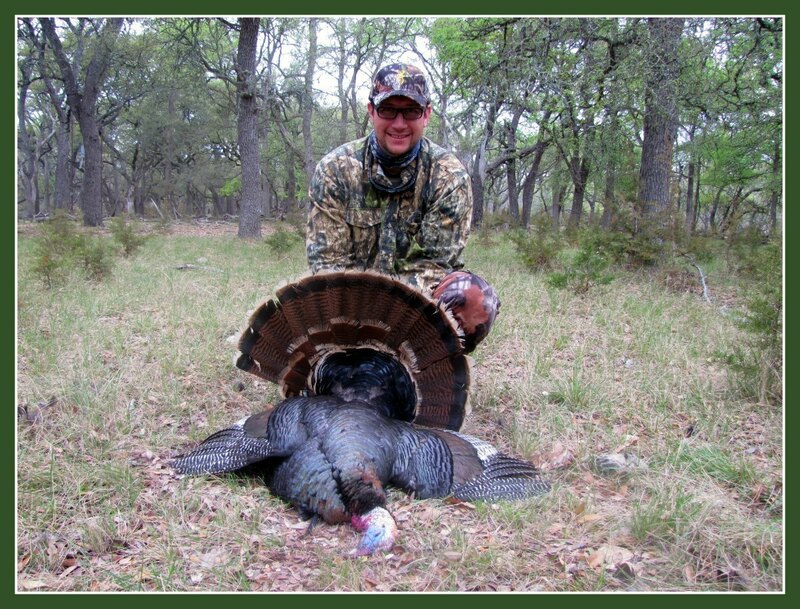 During the spring turkey season gobblers will be calling all day trying to locate a receptive hen, so the early afternoon is a great time to locate a lonely tom. As the afternoon winds down, most hunters will start to head back within calling distance of the roost hoping to cut the birds off before they roost for the evening, but with this being a semi-guided hunt you are free to hunt as you prefer. The Rio Grande Turkey is similar is general appearance to the other subspecies of wild turkeys and about the same height/size as the Osceola turkey. They typically stand 36″-48″ tall and mature male turkeys, called gobblers or toms, weigh about 20 lbs and the female turkeys, called hens, weigh about 12 lbs. Rio Grande turkeys have copper colored tail feathers with yellowish tan tips. When we’re turkey hunting we seem to have our best luck by locating a turkey roost and sneaking into position in the dark and setting up our decoys in the “fly down” zone. With some soft calls, and a little luck, you can coax the turkeys to fly down to your decoys and into position for a shot. If the turkeys don’t cooperate, and you don’t get a shot when they fly down from the roost, it’s time to “run and gun” covering country to locate a “hot” gobbler. Gobblers are on the move all day looking for a receptive hen during the spring turkey season so you can hunt all day or come back to the lodge for some lunch and a quick nap before heading out for your afternoon hunt. As the afternoon winds down into evening it’s time to start heading back toward the roost so you can cut the turkeys off before they head to the roost for the evening. Turkeys have great eyesight, so full camo from head to toe is a must! 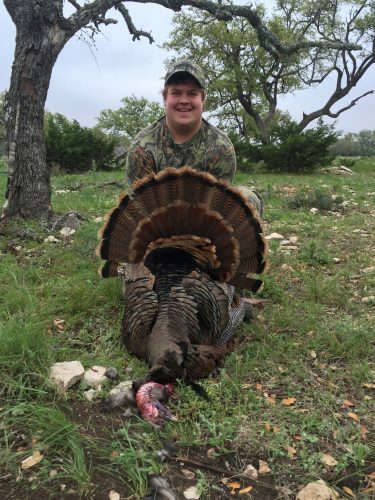 The weather during the spring turkey season in Texas can vary from warm and windy to cold, windy, and rainy if a cold front is pushing through the area. It’s best to dress in layers so you can take off layers as it warms up during the day and add layers as it cools off in the afternoon. The Rio Grande Turkey is native to the Central Plains states with Texas having the largest population of Rio Grande Turkeys. Rio Grande turkey can be found in the Texas Hill Country, Edwards Plateau, parts of South Texas and North Texas and even in a few places out in West Texas but the largest populations of turkeys in Texas are found in the Edwards Plateau and the Hill country. 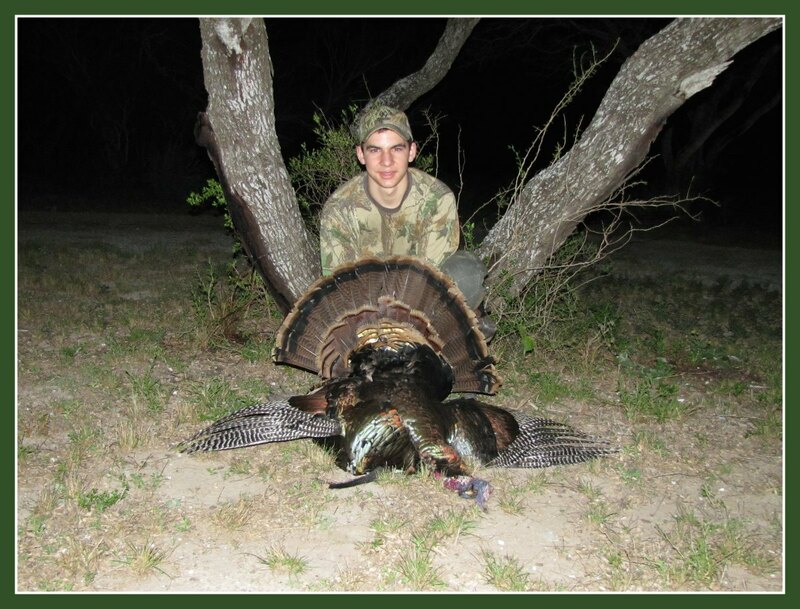 If you would like to read my blog posts about some of my previous Turkey Hunts, click here.